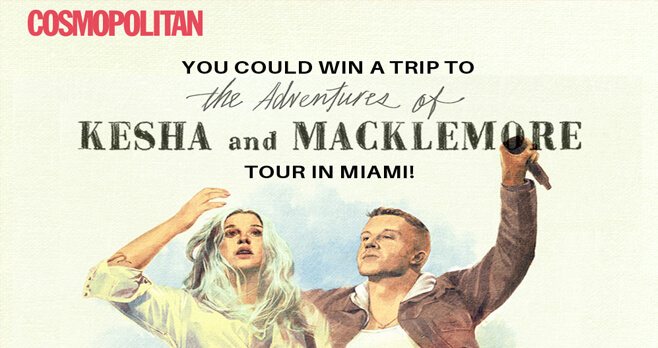 Cosmopolitan is sending you and a friend on a trip to The Adventures of Kesha & Macklemore Tour in Miami with the Cosmopolitan Kesha Miami Getaway Sweepstakes. Enter at KeshaMiami.cosmopolitan.com for your chance to win. Who Can Enter? The Cosmopolitan Kesha Miami Getaway Sweepstakes is open to legal residents of the 48 contiguous United States and the District of Columbia, who have reached the age 18 years old at the time of entry. When To Enter? Sweepstakes is starting May 1, 2018 at 12:01 AM. ET and ending June 27, 2018 at 11:59 PM ET. What Is The Sweepstakes Prize? The Grand Prize consists of a trip for 2 people to Miami, FL to see Kesha and Macklemore live in concert on August 4, 2018.
Who Are The Sweepstakes Winners? For the name of the Winner, send a separate self-addressed, stamped envelope to Cosmopolitan Magazine, Floor 11, Cosmopolitan The Adventures of Kesha & Macklemore Miami Getaway Sweepstakes Winners’ List, Hearst Communications, Inc., 300 West 57th Street NY, NY 10019 within 2 months from the end of the Sweepstakes. I have been a big fan of Kesha since day one, and this tour/concert means a lot to me being a sexual abuse survivor. Not many people can come forward with their story, and still fight.